Your league’s trade deadline is probably this week, so this is your last chance to go BIG! And you can’t go any bigger than targeting the best fantasy asset in years. It’s somewhat of a surprise for Gurley to come up here; he was thought to be untradeable as recently as Monday afternoon. But there are some folks who are thinking about cashing in on a Godfather deal for fantasy’s #1 player, and it’s at least worth discussing. First let’s recap why Gurley is not completely untradeable all of a sudden. He’s coming off of a down box score in one of the more memorable regular season games ever. He does have a bye this week, and there are some team owners who can’t afford another loss, and need to deal him just to have a chance at a win. 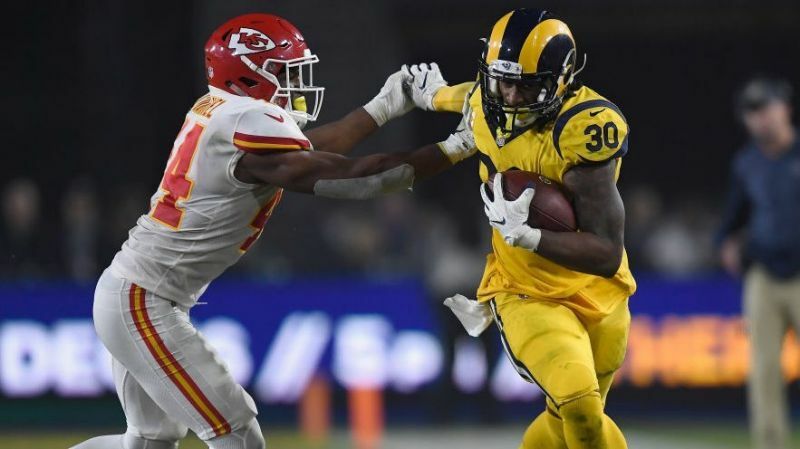 He got a little banged up in the Chiefs game, and while nobody is putting any stock into the severity of the injury, it is a reminder that Gurley is human, and his 253 touches are 20 more than Zeke has so far, and 46 more than anyone else has. Lastly, the Rams have only one loss, and it’s not unreasonable to think that they’ll wind up resting Gurley down the stretch with a bye week all locked up. None of this is a secret, and that makes it possible to put together a package for him. Of course you’d highlight the reasons why the team owner with Gurley should give it some thought. It’s going to take a lot to get him, but now is the time to trade depth anyhow, as it won’t do you much good with the bye weeks just about behind us. I would start with any big names you have on your roster who don’t have a favorable playoff schedule, and I’d get to work on a 3 for 1 that nets you the best player in the game. Schuster has been featured on our Trade Targets before, and we’re going to go back to him just before the trade deadline. He’s having a fine season, on pace for over 103 receptions, 1385 yards, and 5 touchdowns. That makes him a low end WR-1, so Schuster is another player who won’t come cheap. But I think it’s worth trading a pair of decent players with sketchy playoff schedules for him. Schuster’s schedule in weeks 14-16 is pristine, at Oakland, vs. New England, and at New Orleans. It’s worth going out of your way to get him. Besides, I still don’t think he’s being valued as a Wr-1 yet anyhow. You’re not going to get a big haul for Barber, who everyone knows is a pedestrian talent playing in a throw first offense. But coming off of a 106 yard + a touchdown performance, you might be able to sneak him into a 2 for 1 deal with a team owner who is desperate for any playable running back. And if he’s just an extra tossed in to tip the scales in a deal that gets you a prime player, throw Barber in without any hesitation. Barber’s workload is likely to take a dip with Ronald Jones due to back this week. And with the way Jones has played since preseason - that tells us all we need to know about the kind of short leash Barber is on. There probably aren’t more than a handful of running backs in the league who wouldn’t threaten Barber’s workload. The schedule will not be kind to Barber in the weeks that matter most, with match-ups vs. the Panthers and Saints in weeks 13 and 14, and at the Ravens and Cowboys in weeks 15 and 16. Barber’s outlook for that month, especially with Ronald Jones back, is so poor, I’d almost consider dropping him in the hopes that someone would actually pick him up and start him against me.